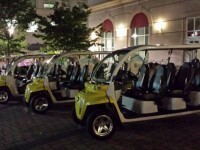 Urban Eventours provides a fun and unique transportation experience, through use of our 5-passenger, all-electric vehicles. Enjoy our eco-friendly way of being transported to and from parking facilities to hotels and/or hotels to conference/meeting venues, restaurants, and other urban sites. What a fun way to get around town! We also provide team building excursions, be it through tours, scavenger hunts, etc. We give you that “lift” you need. Think Urban Eventours when planning your next Conference, Reunion, Outing, Sporting Event, Tour, Wedding, Photo Ops, Receptions, and much, much more!